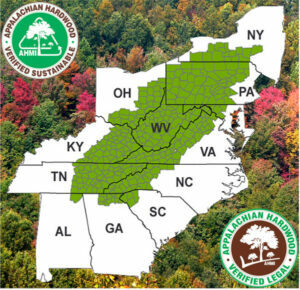 Since the 1940s, Appalachian Hardwood Manufacturers, Inc. members have focused on educating landowners and the public about sound forestry practices. AHMI is one of few trade associations with a division devoted to forestry and the advancement of sound forestry practices. We have compiled a wealth of information here that ranges from the early years of forestry to modern practices. It is the hope of AHMI members that this assists you in learning more about forest management in the Appalachian Mountains and the world’s greatest natural resource. TREES! Q. When you listen to the evening news, it sometimes sounds as if America’s forests are about to disappear. Is that true? A. Not at all. About one-third of the United States — 728 million acres — is covered with trees. That’s about 70 percent of the forest land that existed when Columbus discovered America. And the amount is growing. In fact, we have more trees today than we had 70 years ago. Scientists estimate that America’s forest land contain some 230 billion trees — around 1,000 for each person. And more trees are being planted each year. On the nation’s commercial forest land, net annual growth exceeds removals through harvesting by an impressive 31 percent each year. And the amount of wood in our nation’s forests continues to increase. We have added 28 million cubic feet of wood since 1977. Q. Are we damaging the land by cutting so many trees? A. Roughly one-third of the nation’s forests—245 million acres—is set aside in national parks and wilderness areas, and in other “non-commercial” areas. This third of the U.S. forests is bigger than Norway, Sweden, Denmark, Austria, Holland, Switzerland, Belgium and Israel combined. The remaining lands are classified as “commercial” and can be used for growing and harvesting repeated crops of trees. But even in the national forests, portions are permanently set aside for non-commercial uses such as recreation and wildlife. Q. Who owns commercial forests? A. Of the nation’s 483 million acres of commercial forest land, 136 million acres are owned by federal, state and local governments. Fifty-seven percent of the remaining commercial woodlands—some 276 million acres—are held in relatively small tracts by individual private owners. About 70 million acres—or 14 percent of the total commercial forest land— are owned by the forest products industry. Q. Is there a difference between a national forest and a national park? A. A big difference. By law, national forests are working forests, set up by Congress in 1897 to provide the nation with a continual source of wood products. The national forests also provide an important resource for wildlife habitat, for fishing, camping and other forms of recreation. By contrast, our many national parks, like Yellowstone, are intentionally set aside for non-commercial uses and are not managed for timber or other resource production. These parks are intended to approximate natural conditions. In fact, when there’s a fire on a national park, areas where the trees were burned are not replanted. The forest grows back naturally…no matter how long it takes. This protection is even more extreme in the 90 million acres formally designated by Congress as wilderness areas. There, even roads are not allowed, so that forest land remains much like it was before Columbus arrived. Q. Why do logging companies sometimes take all of the trees out of an area? A. That logging technique is called even-age management – removing all of the trees from a stand rather than picking and choosing. Some seedlings won’t grow in the shade of mature trees, so removing all of the trees in the stand allows the light to reach the forest floor. And sometimes something calamitous, like a fire or windstorm, a tree disease, or an insect epidemic, requires that the damaged trees be removed so that new trees can get a start. In each case, the type of harvest method (eg. selective thinning and even-age management) used is dictated by the type of tree being harvested, the terrain, and what conditions are needed to start the next forest there. Q. How long does it take for a logged area to look good again? A. You can see new life begin to flourish almost immediately. Within one to two years, the area will be abundantly covered with grasses, bushes and seedlings, and there will be a noticeable increase in wildlife. Within five years, the meadowlands will begin to fill in as those seedlings become young trees. Depending upon the soil and climatic conditions of the region, you will see the first signs of the forest within 10 to 15 years. When a select harvest is completed, the smaller trees left in the area will increase in size rapidly with the new infusion of light and moisture. Q. Do timber companies replant when they cut? A. Yes. Forest products companies are in the business of growing and harvesting trees, so reforestation is important to them. In fact, three quarters of all the trees planted in America last year were planted by forest products companies and private timberland owners. And logging companies pay a special fee to fund for replanting and reforestation when they buy the right to harvest a section of timber on state or national forests. In the Appalachian hardwood forest, nature replants on its own using seeds and stump sprout to grow trees for the future. Foresters often leave areas to reforest naturally from cones and seeds. Q. How many trees are planted each year? A. Last year, more than 2.3 billion seedlings were planted in the United States by the forestry community. That’s more than nine new trees for every man, woman and child in America. Q. Who plants those trees? A. Of those 2.3 billion seedlings, nearly 55 percent were planted by the forest products industry. Tree farmers and other non-industrial private landowners planted another 28 percent of the total. The rest were planted by federal, state and local agencies. Georgia, Florida, Alabama, Mississippi, Oregon and Washington are the leading tree-planting states, in that order. Q. Is it true that we are losing all of our old trees? A. No. The United States has 7.5 million acres of old growth trees, trees 200 or more years old. If you put those trees together, they would form a band two miles wide stretching from the Pacific to the Atlantic Ocean. And over half of that acreage, 4.2 million acres, is protected in national parks and wilderness areas. Those trees can never be cut. All of the really old trees, like the giant sequoias, are protected. Even in our working forests, as much as a quarter of the remaining old growth is located in areas where they will never be logged. Where old growth is being harvested, it is being cut at a rate of only one percent a year. And as those old forests are harvested, they are replaced with new, vigorous forests that will one day be considered old growth before it dies. Because trees live so long, it is easy to think of them as permanent. But they are not. If natural threats like fires, windstorms and insects don’t get them, trees eventually dies of old age — to be replaced by young trees, which eventually become old trees. Q. Does logging silt streams? A. Logging companies follow very careful regulations that prohibit logging across streams, and use logging and road-building techniques which further reduce erosion. Special measures are also taken to leave a buffer of trees along stream banks to guard against erosion. Chances are the water you drink today comes from a forest. Communities near forest areas depend on the streams for water, and don’t have a problem with water quality. In fact, some of the purest water in the country comes from areas which are logged on a regular basis. Logging is a watershed practice to even out the flow of water that would otherwise be evaporated by the trees. Q: How can forests be good for water? A: Forest soils act much like a blotter, by filtering microscopic organisms from the water. In fact, the closer natural water is to a forest, the cleaner it is — which explains why municipal reservoirs are located as close as possible to the forest, collecting the water at its cleanest point. The forest also regulates the flow of water. Forest soil 36 inches deep can absorb 18 inches of precipitation, then gradually release it into natural channels. In this way, forests slow the volume of rainwater discharged into streams and rivers immediately after a rainstorm or snowfall. Newer forests are better water cleaners than old forests. An over-mature forest of large, old trees removes little nitrogen through its root system, passing most of it on to the soil. Younger trees filter out nearly all of the nitrogen and phosphorus, leaving water virtually free of these pollutants.